So, there I was on the grounds of a nice resort. And I was taking photos of downspouts and drains. That sounds about right, doesn’t it? Posted on January 10, 2017, in Photography and tagged 365 photo project, black and white photography, Leica, melinda green harvey, monochrome, one day one image, photo a day, photography, postaday, san antonio, san antonio texas, texas. Bookmark the permalink. 7 Comments. You can tell no one’s taken over the blog – it’s still me! Nope. Just this one. 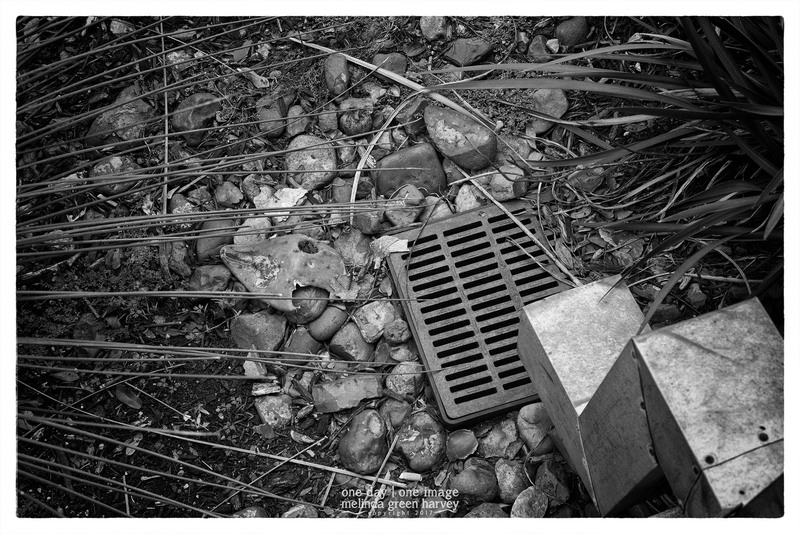 You, my friend, have cornered the market on storm drains. That chunk of cactus looks quite a bit like a fish head. I wondered what was unsettling about this shot, but it is not immediately obvious. Well, it DOES look like a fish head, which I didn’t notice until you pointed it out. And now neither of us can un-see it!